Start the Chinese New Year out right by celebrating with your friends and family! This year, Chinese New Year will begin on Tuesday, February 5, 2019. Actually, the Chinese New Year isn’t celebrated on just one day like you might expect. It’s celebrated for nearly two weeks, giving everyone a lengthy chance to ring in the coming year. This Chinese New Year will be celebrated until February 19th. Chinese New Year isn't just a holiday in China. It's observed around the globe, and there are many ways that you can begin celebrating. You might also hear Chinese New Year to be called Spring Festival. This is a more recent name for the day that is used in modern China. In addition to the “Spring Festival” name, you might hear it referred to as the Lunar New Year. That is because the Chinese New Year falls on the second new moon after winter solstice, so the date of the festival relies on the cycles of the moon. With Chinese New Year approaching fast, you might be wondering how you should celebrate the occasion. Chinese New Year is a time for family and friends to gather together and get ready for another year. It’s a time to set the tone for the coming months and wish for luck and prosperity. Another wonderful thing about Chinese New Year is the public celebrations. Many people gather together to celebrate with festive firecrackers and fireworks. There are also sometimes dragon dances where dancers make their way through the streets with beautiful and intricate dragon costumes. The atmosphere is electric, and it's a powerful way to kick off the next year. Share Gifts and Greetings - Another great tradition is giving gifts. If you celebrate Chinese New Year, be sure to share the joy by giving your friends and family gifts and Chinese New Year ecards. It’s important to let your loved ones know that you are thinking of them and wish them a happy year ahead. Attend Festivals – As mentioned above, there are often many public gatherings and displays that help ring in the Chinese New Year. Big fireworks displays or smaller firecrackers are used to illuminate the night and add to the festive atmosphere. Give a Red Envelope – Mostly given to children or grandchildren, the Chinese New Year tradition of giving a red envelope filled with money is very popular. In addition to giving money, a red envelope symbolizes your wish for the person to have a positive and lucky year. The amount you should give depends on your relationship with the person, and many families participate in this money giving tradition each year. If you don’t already celebrate Chinese New Year, you probably are not familiar with the traditions associated with the holiday. However, there are many great traditions that make celebrating the festival even more exciting. Don’t Sweep Up! - One tradition that you might enjoy is more of a superstition than anything. It’s said that if you sweep or clean on the Chinese New Year, you will essentially be sweeping away your good luck. That’s a pretty good reason to take the day off of cleaning! Eat Lucky Foods – During Chinese New Year celebrations, even the food can be lucky. Each food is associated with a different type of luck, so be sure to eat what you want to have in the coming year. Some examples are spring rolls or dumplings for wealth, fish to boost your prosperity, and longevity noodles for (you guessed it!) long life. Decorate Your Home – Chinese New Year is very closely associated with the beautiful decorations used to mark the occasion. Many put out glowing lanterns to decorate their homes and even their businesses. There is even a tradition of creating stunningly detailed paper cutouts from red paper. If you are looking for a little help creating these beautiful yet complex designs not to worry, there are many guides online to help you. If you know about the Chinese Zodiac, then you know that there are twelve animals associated with different years. The Chinese Zodiac runs in twelve-year cycles, so each year matches with one of the twelve animals, and it restarts every twelve years. The Chinese Zodiac animals are the following: a rat, an ox, a tiger, a rabbit, a dragon, a snake, a horse, a sheep, a monkey, a rooster, a dog, and a pig. 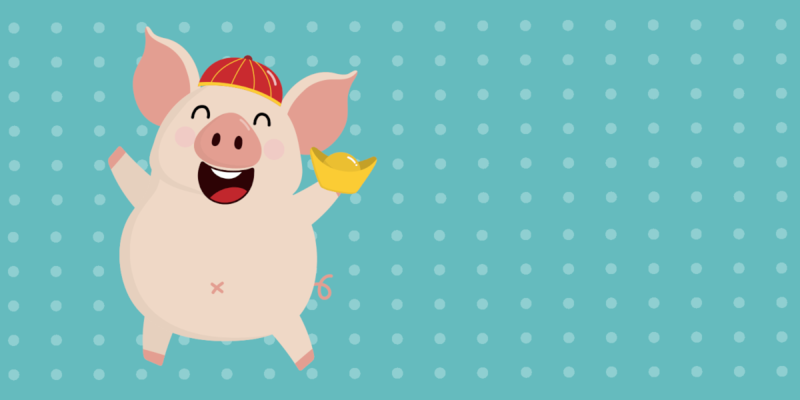 2019 is actually the year of the pig! Did you know that specific colors can actually be considered lucky? You probably have a favorite color, but Lucky colors go beyond someone’s preference. They are deeply rooted in tradition. While Chinese tradition attributes many different symbolic meanings to colors, the New Year is usually celebrated with a red and gold color palette. You may have already noticed that red is used in many Chinese New Year decorations. That is because red is supposed to scare off any bad luck. Commonly, red lanterns will be hung outside of people’s home and businesses to achieve this goal. Another New Year’s color is gold. That has a very obvious association with money – which everyone can use more of in the years to come!